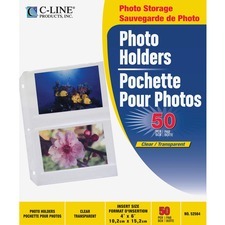 C-Line Traditional Photo Holder - 4 Capacity - 5" x 7" - 3-Ring Binding - 3-Hole Punched - Refillable - Clear Polypropylene Cover"
Letter-size photo mounting sheets organize your photos with write-on inserts and secure pockets. 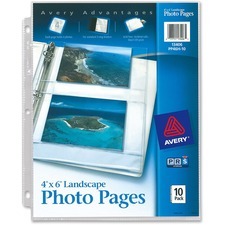 Use to mount your photographs for storage in three-ring binders. Side-loading design is easy to use. 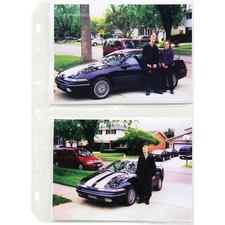 Photo mounting sheets offer archival-quality, acid-free protection. Display your photos with variety suitable to your diverse subject matter. 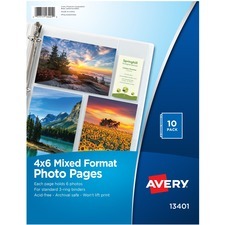 These Photo Pages allow you to insert six 4" x 6" photos in each page. Three protective photo pockets offer the option of portrait and landscape orientation on the same page so you can properly appreciate your photos of both soaring skyscrapers and sunsets that stretch the length of the horizon. 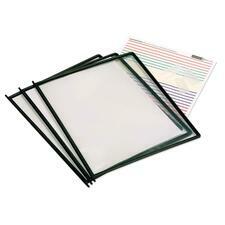 Pre-punched holes let you fit the pages conveniently in standard three-ring binders. The photo pockets are acid-free and archival-safe to ensure your many photos stay in top condition to show off again and again. Heavy-gauge polypropylene material will not lift type or stick to your reference materials. Nonglare surface allows for in-sleeve photocopying. Includes indexing tabs. 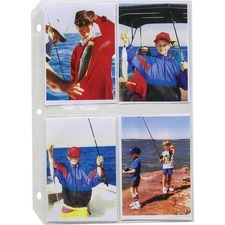 C-Line 3-Hole Polypropylene Photo Protector - 8 Capacity - 5" x 3.50" - 3-ring Binding - 3-Hole Punched"
Horizontal Photo Pages allow you to insert four 4" x 6" photos in each protective pocket. They are three-hole punched for convenient storage in a standard three-ring binder. 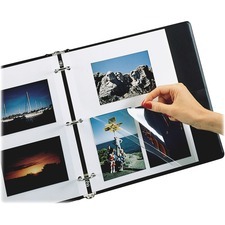 Archival-safe, nonstick polypropylene material protects photos in individual pockets. The photo pockets are acid-free and archival-safe to ensure your many photos stay in top condition.